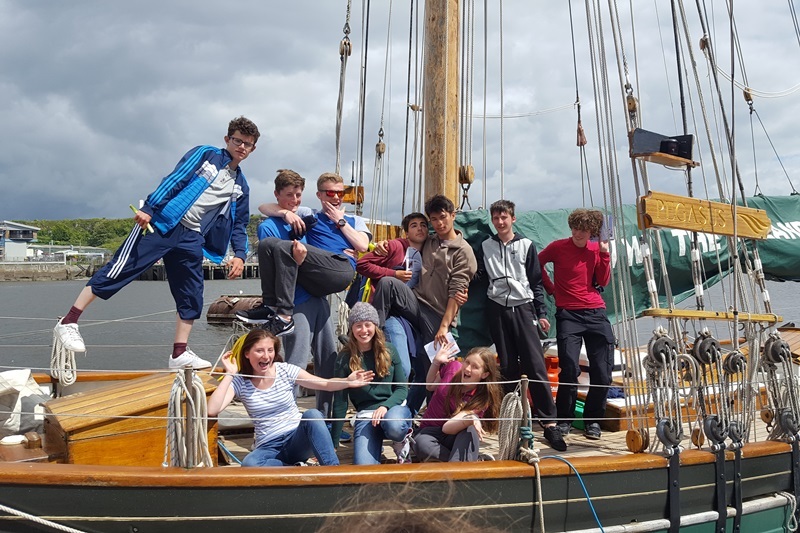 We are a Duke of Edinburgh’s Award Approved Activity Provider and run DofE Gold Residential sailing weeks. To achieve your Duke of Edinburgh’s Gold Award you must complete the Residential, and to support our charitable work we run DofE Gold Residentials during the school holidays. This involves spending 6 days and 5 nights away from home on a shared activity with people you’ve never met before – join as strangers and leave as friends. 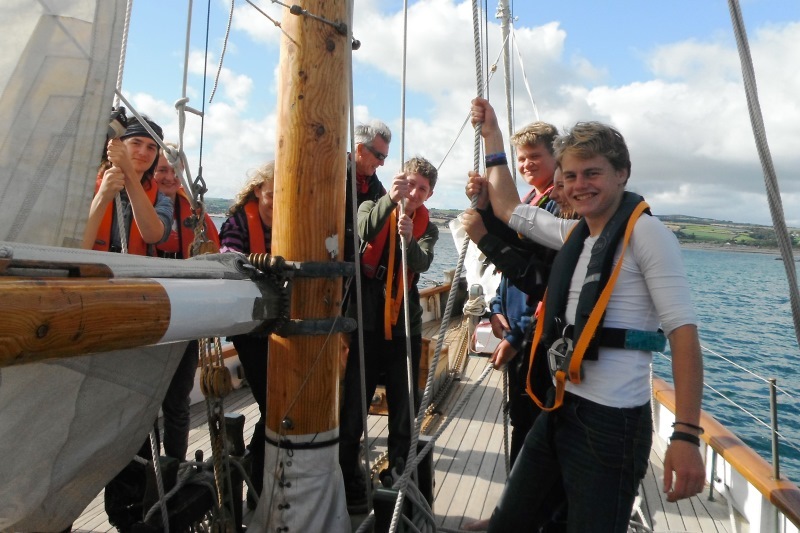 You can qualify for the DofE Gold Residential Award on board during Teenage Sailing Courses and other sail training voyages lasting at least 6 days. Always check with your DofE Leader first. You can read all about other peoples’ experiences by following the links and looking at our Facebook page. Voyages follow the RYA Cruising syllabus and most include the option to gain RYA qualifications. We sail in the magnificent waters of the South West of England, where there are plenty of hidden coves, tiny islands and harbours with places to fish, swim, visit beaches and have barbecues. On an exceptionally good weather week, we are sometimes able to reach the Isles of Scilly and the Channel Islands. You and the rest of the crew are responsible for all aspects of life on board, from helming and navigation to cooking, keeping the boat clean and tidy, getting the sails up and rowing ashore. Our professional sailing staff will show you exactly what you need to do. There’s plenty of time to chill out on deck after all the work is done and keep an eye out for dolphins, basking sharks, or to catch some mackerel for supper and chat in the sunshine. So much fun! From not having sailed before at all, Craig and Hannah made me feel welcome and at ease from the start. It was amazing to have been able to sail during the night several times, and to learn so much in one week, as well as completing my DofE Gold Residential trip. It has made me more confident in meeting and working with a new group as well as gaining skills in sailing that will help me in the future. The best bit of the voyage was sailing down wind, in the sun, with all the sails up and being able to understand how everything worked. On my voyage we went to France, which involved two challenging 20+ hour channel crossings, but an enjoyable challenge nonetheless, and the night sailing and the stars was amazing. I gained new knowledge about sailing large yachts, and I learned new cooking skills in confined spaces. *The voyage itinerary is a guide only and the destination will be weather dependent. **All courses follow the RYA Cruising syllabus, and can include the option to gain Royal Yachting Association Qualifications. Photographic ID is required for voyages visiting the Channel Islands. A Student ID card or a Citizencard fulfils these requirements. We will inform you beforehand if ID or a Passport is needed for your voyage. Travel insurance will be required for excursions abroad. If you need some advice about whether this is the right choice for you, or you want to know which type of voyage to choose please call us on 01752 823007 or email us.